I’ve been looking for the cygnets ever since I saw them in the nest on May Day, but haven’t been able to locate them until today. I was walking along the River Corrib near the Wolfe Tone Bridge and spied a swan moving slowly up the far side of the river. Trailing behind were two little cygnets. I can’t say whether this is the same swan and babies because there are loads of swans around Galway. In addition, the swan’s nest I saw had at least five or six cygnets and this swan only had two. Thinking positive and ignoring natural selection, I’m going on the assumption this was a different mother. It was entertaining watching the little ones follow mother as she headed up stream. They stayed close to the bank and at one point their little legs must have been tired of swimming so they crawled up onto the rocks and walked for a ways. Mother continued swimming, looking back periodically to make sure they were following. They took their time, exploring the rocks and she had to swim back and re-focus their attention on the journey. The scene was so common it could have been a human mother and children. As they neared O’Brien’s Bridge I wasn’t the only one following their progress, at least half a dozen people were keeping watch. On the other side of the bridge along the bank where they were swimming is a waterfall where the canal feeds back into the river. I wondered if the toddlers would be able to handle the swift moving current. They made it about half way under the bridge, but weren’t strong enough to fight the water coming in from the waterfall, and drifted back. Another gentleman and I went back over the bridge to see what would happen next. After several more attempts, the tiny tots chirping loudly as their legs spun but their bodies didn’t move forward, Mom had to come to the rescue. One cygnet was hoisted onto her back, but she had a hard time getting the other on top. 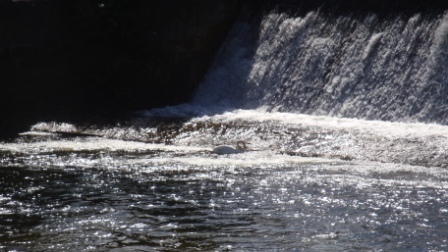 It must have been the brave one, making several more attempts to head upstream, only to stagnate, chirping for help. She was able to get the second one on her back briefly, but it either fell off, or was possibly pushed off by the other little one – you know how siblings can be. 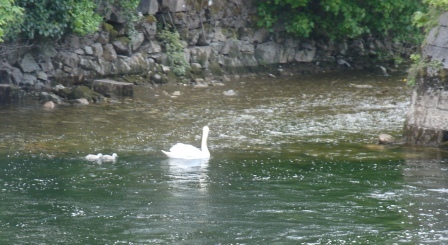 Eventually the swan was able to get both on her back and resumed her upstream course. By the time I reached the opposite side of the bridge and saw them come through, the brave one had either fallen or been pushed off her back, but they were far enough along that it could swim without being forced backward. They headed for a shallow part of the waterfall where they climbed onto a rock to rest. The remaining rider slid off Mom’s back and they stood resting while the mother preened herself, probably catching her breath for the next segment of their journey.